Kris Commons told Sky Sports News he is concerned by the recent incidents where objects thrown onto the pitch have hit players and managers. Kris Commons is concerned there will soon be a serious incident following the recent spate of incidents involving objects being thrown onto the pitch. 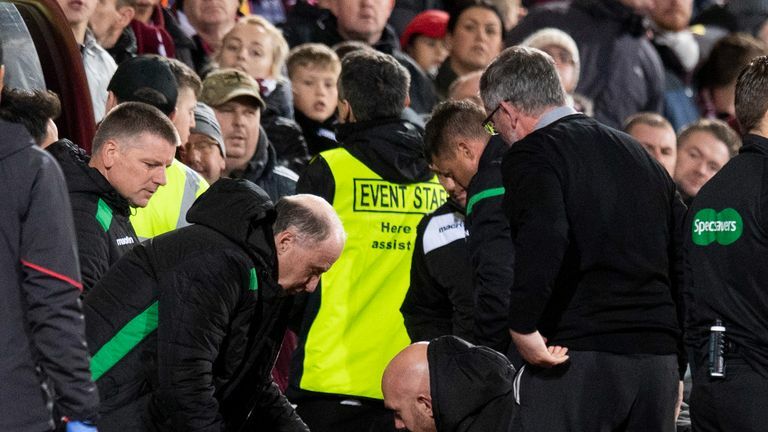 Hibernian manager Neil Lennon was struck by a coin thrown during last week's Edinburgh derby with Hearts at Tynecastle, while a man has subsequently been charged in relation to an assault on Jambos goalkeeper Zdenek Zlamal in the same game. Rangers striker Alfredo Morelos was also hit by a coin at the weekend while celebrating his goal in their 2-0 win at St Mirren and, although Commons says it was a problem during his playing days, the former Celtic player says action needs to be taken before a player, coach or official suffers a life-changing injury. "Not only are missiles entering the field but now they are striking people," Commons told Sky Sports News. "I don't think this is a new thing. When I was playing it was happening on a regular basis. As a supporter, if you are next to someone who is throwing missiles, as a supporter of the football club you have got a duty to name and shame. "If you walk around the pitches now, you still see coins on the park, specifically when people are taking corners. "Now it has gone to a different level, with Neil Lennon getting struck in the face. You are getting coins coming towards managers and coaching staff and it is becoming a real concern. "It is probably going to take someone getting seriously injured for anyone to do anything." In response to the recent incidents, Commons has urged fans to report fellow supporters who throw objects onto the pitch. "As a collective group, people need to get together and sort something out," he added "Whether you can get cameras within the ground to look at certain areas [I don't know]. "As a duty as a supporter, if you are next to someone who is throwing missiles, as a supporter of the football club you have got a duty to name and shame. "Someone is going to get hurt and that is a big concern. If it hits them in the eye, then that's their career over. "It's been highlighted this week and a couple of weeks ago with the Livingston event where a linesman got hit and cut the back of his head cut open and Neil Lennon [getting hit] in the face. "It's happening more regularly and it is not going to be long before someone really does get injured."